As conscientious carnivores go about the noble business of supporting local, small, nonindustrial, and humane animal farms, the international exchange of animal products proceeds with nary a pause. Exploring the underworld of global meat exchange tends to quash any hope for responsible alternatives to industrial animal production. At the intersection of Neoliberalism and meatonmics is a vivid reminder that our trendy support of boutique animal farms have no bearing on the problem at large. The problem at large, really, could care less about your locally raised pork cheeks More often than not, Chinese demand drives the quest for flesh and all that its production requires. To wit, representatives from the English livestock industry are currently assessing China's market potential for English sheep. The Chinese have more sheep than any nation in the world. Still, they can't come close to meeting growing consumer demand. The English are happy to halt the reforestation of British uplands to help the Chinese meet their meat. In China, meat consumption has spiked from four kilograms per person in 1961 to 57 kilograms per person in 2011. You can count on it: the English will do anything, including degrading their own landscape, to ensure that the Chinese don't want for righteous lamb chops. Another global commodity has brought together the Irish and the Vietnamese: pork. The precipitating event came when Vietnamese veterinary authorities opened the door for frozen pork from Ireland. Vietnam has long been identified by Irish officials as a "priority target" - I love how industry uses such verbiage - and the announcement of this deal led to the immediate opening of five Irish pig processing plants dedicated exclusively to supplying Vietnam. Jobs! 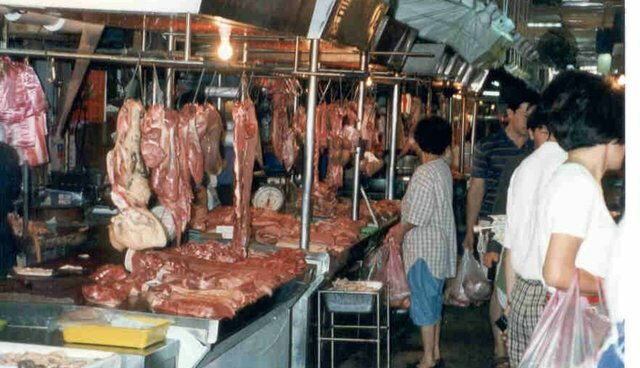 Currently 80 to 90 percent of Vietnamese pork comes from backyard herds. That's about to change. You'll see it happen as Ireland gets greener. Yet another example that killing sentient animals and destroying the environment fosters international bonds involves Denmark and Russia. The unifying ingredient here is salmon. Russia, which has banned salmon imports from much of the West, has turned to Denmark's Faroe Islands for its salmon stash. The Faroese, who were formally banned from importing to Russia, are as happy as a fish in water: "We're in the opposite situation from before Christmas," said an Faroe Island official. "Before, everyone could sell to Russia except us [due to Russian bans on certain Faroese trawlers]. Now, only we can." The Russians have also asked the Faroese to exploit their waters for mackerel and herring while they're at it. Our estimated environmental footprints suggest potential regional impacts on climate, biodiversity, ecosystem services, and a possible incremental soil phosphorous saturation that could increase the risk of eutrophication in the long term. And there's nothing that your happy meat can do about it. All meat must be stigmatized. Not just industrial.